There are over 50 of us in this challenge. All of us will be working hard to create a cohesive line of jewelry and pull our look and thought process together. At the end, we will reveal a line of jewelry with a minimum of five pieces, all in our chosen style. Let me tell you a little about me. I've been making paper-based art for years. 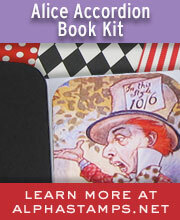 I started out with simple greeting cards and evolved into highly embellished cards. I was a design team coordinator for a small online paper craft shop for a few years. I've since branched out to altering 3-dimensional objects, from mini Altoids tins to blocks of wood to old cigar boxes. Shadow boxes are my favorite projects now -- or maybe it's just the excuse to rummage through flea markets for the perfect "found objects"! In addition to the paper and mixed media, I make Argentium silver chainmaille jewelry. I start with raw wire and finish with a beautiful clasp and a tiny sterling silver heart. Last year I started collecting and wearing vintage rhinestone jewelry. I'm very inspired by Miriam Haskell, Stanley Hagler and Robert Demario. Being the creative type, I decided to learn cagework and tapestry beading and make my own new beauties from reproduction and vintage parts that couldn't be repaired. That's how I found B'Sue Boutiques! 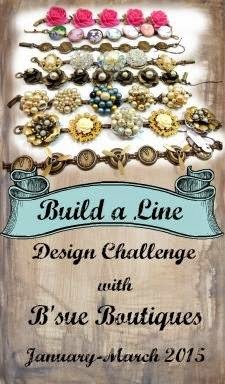 The B'Sue Boutiques "Build A Line" Challenge! Without further ado, let me tell you a little about my new line, called Flights of Fancy. 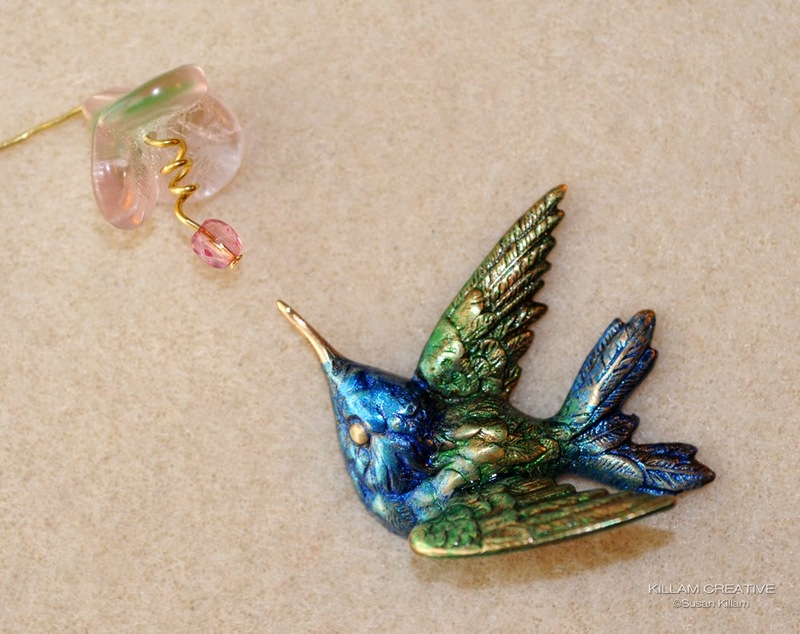 Through each piece we will know a little more about the oh-so-busy life of a wee bird called Fancy. Here she's wearing her favorite peacock feather outfit. Tomorrow she might go for a phoenix's fiery reds and oranges. She never knows until the first light of day! Fancy wearing her favorite peacock "outfit"
I'm still getting to know her, too. What I do know is she will be featured in each piece. These gorgeous B'Sue Boutiques brass components below (plus much more!) are all part of this new line. I'm not sure how it will work out yet, but I'm sure Fancy will help me along the way! 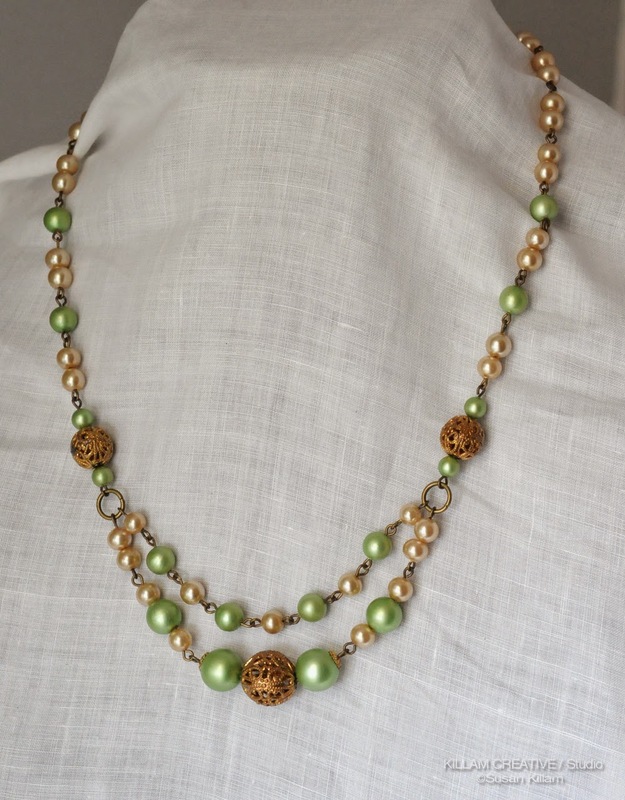 Here's an example of how one necklace may turn out. There's a lot of tweaking to happen, but I like where it's going! The next "Build A Line" blog hop is February 20th, and I'll be showing you a couple of finished pieces as well as progress I've made along the way. There is a lot that is new to me and at this point I'm either frustrated that something didn't turn out as I'd hoped, or doing a happy dance that it did. :) I like the happy dances much better! Here's a peek at my work space. 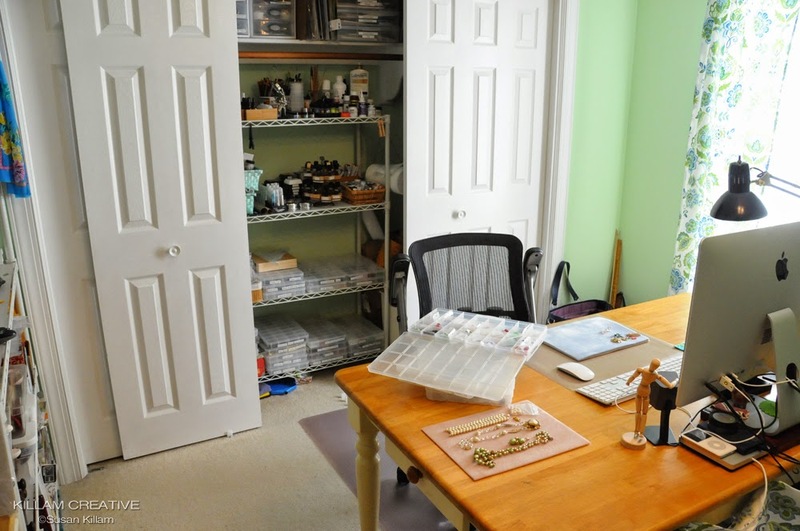 Supplies for all types of jewelry making and mixed media conveniently behind me! Here is the complete list of "Build A Line" challenge participants -- women from all over the globe have taken on this challenge. 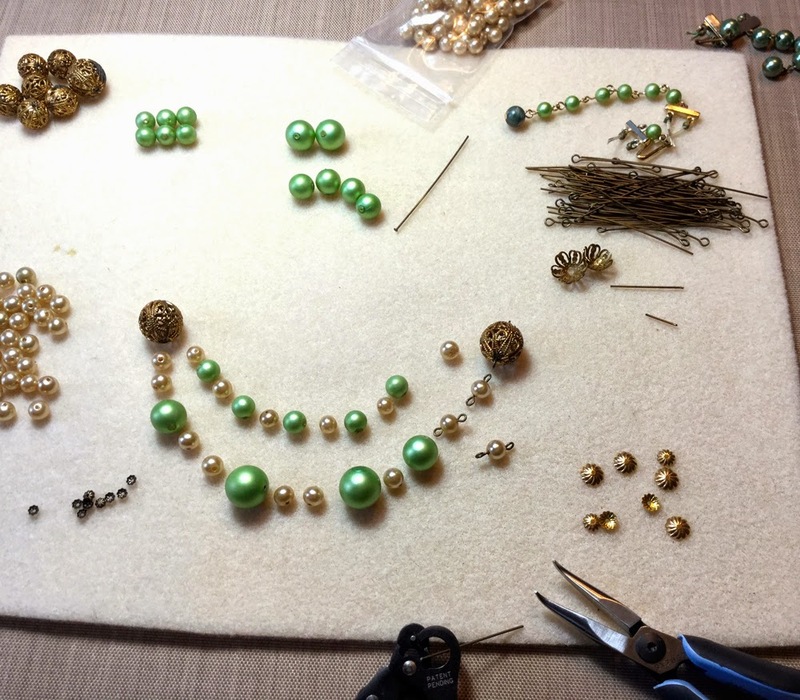 We are all at different stages of jewelry making experience but have one common goal: to learn the skills and discipline to build a successful, cohesive line of jewelry. Won't you join us? Brenda Sue Lansdowne, B'sue Boutiques <<<<--------- Our hostess with the mostest! Susan Killam <<<<--------- That's me! 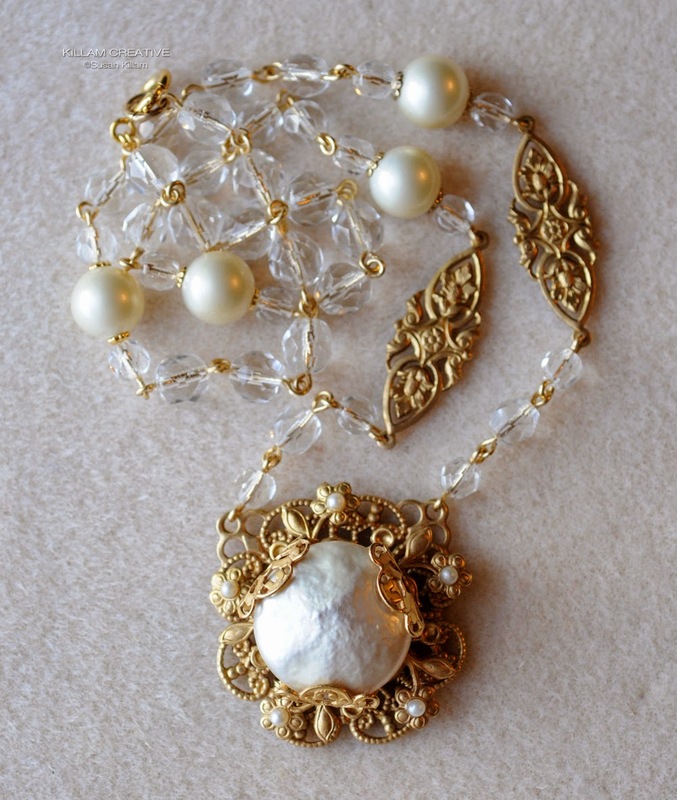 I want to share the first repurposed vintage* jewelry piece I made. All the beads had a former life, just not necessarily together. 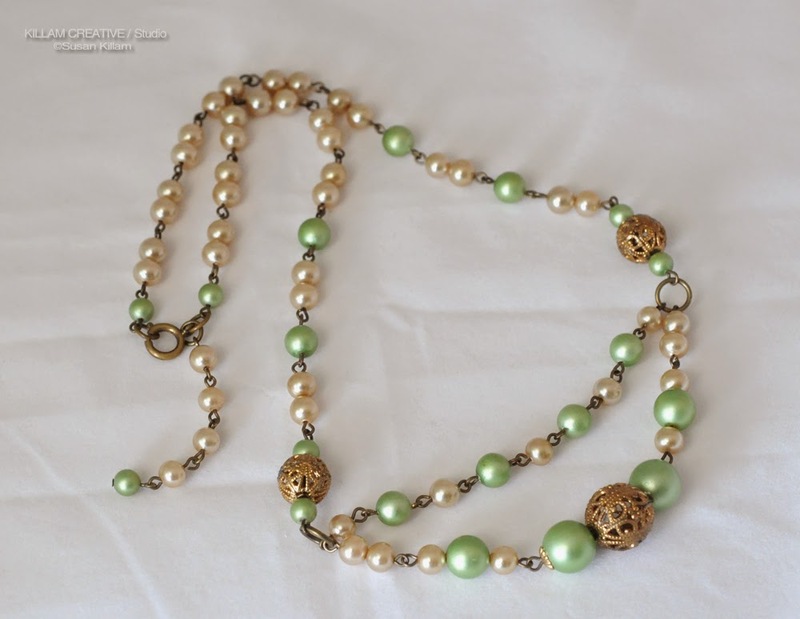 The lime green and gold beads were on a Lisner multi-strand necklace, along with some interesting marbelized green ones (to be used later). The glass pearls were in a vintage log I purchased somewhere. I thought they were from my teenage jewelry box, but no. Those are still waiting for a project. That lime green is almost exactly the same as my studio walls. Yup. Lime green inspires me! Anyway, all the beads were wired by hand. I found a great tool to make the eyes -- called the Bead Looper. It's not perfect out of the box and did require some tweaking to get the eyes right, but it makes the job easier. Here's an early planning photo. Changes were made to this design! I found that, much like my paper-based projects, it's better if I start with a very basic "outline" and just get going. Otherwise I spend too much time on planning. Plus, art of all kinds evolves as it takes form, right? That's my story and I'm sticking to it! I forgot to add the earrings! There are matching earrings, but I need earwires for them. I'll show them another time. Thanks for visiting today! I'll be participating in a blog hop Friday for the B'Sue Boutiques Build-A-Line challenge. I'll be able to share my idea for this new line and share some of the components. It's pretty exciting! Oh, and it will not involve repurposed vintage* bits, so it will be very different from what you see today. A Jewelry "Build A Line" Challenge, Accepted! Hello creative folks! As you might imagine by the lack of projects posted last year, I wasn't exactly prolific with my paper passion. This, that, and the other took precedence and many paper projects started have not been finished yet. They will be, I promise! ...Especially an awesome 3D Christmas themed piece I can't wait to share. But! That's not why I'm here today. I want to share my new adventure with you! 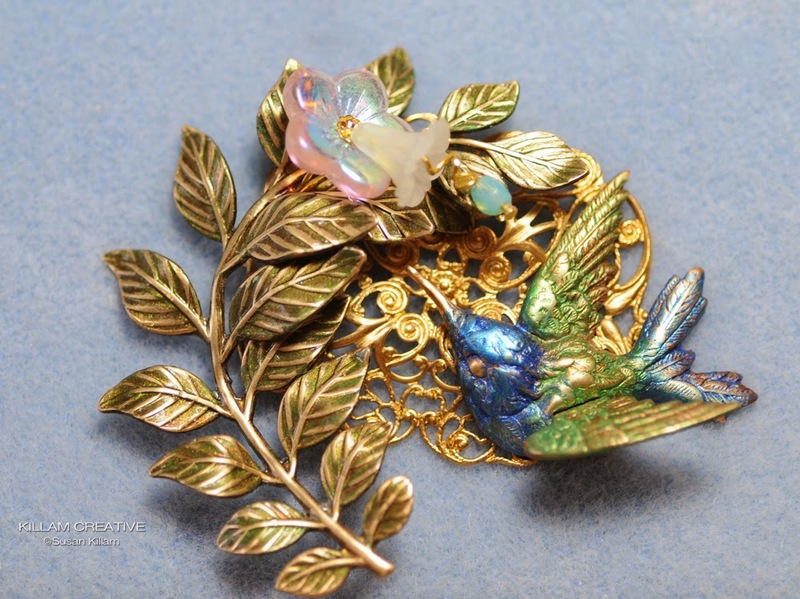 One thing I did manage to do last year was develop a healthy obsession with vintage costume jewelry. Oh, the auction sites I've seen! I've purchased many lots and, along with the pretty pieces I can wear or put in my vintage jewelry Etsy shop, I also have a bunch of pieces that really aren't salvageable. 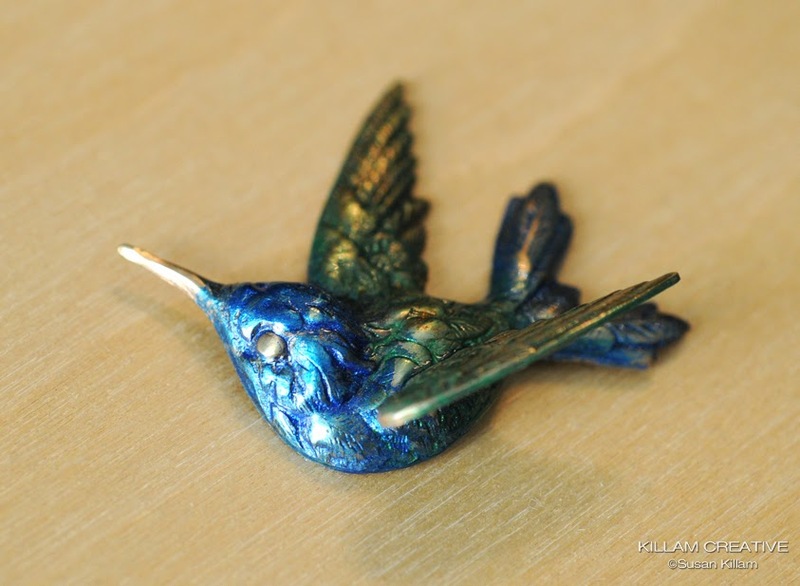 Soooo, off to the web I went to learn about repurposing vintage costume jewelry, and I found Brenda Sue Landsdowne at B'Sue Boutiques. 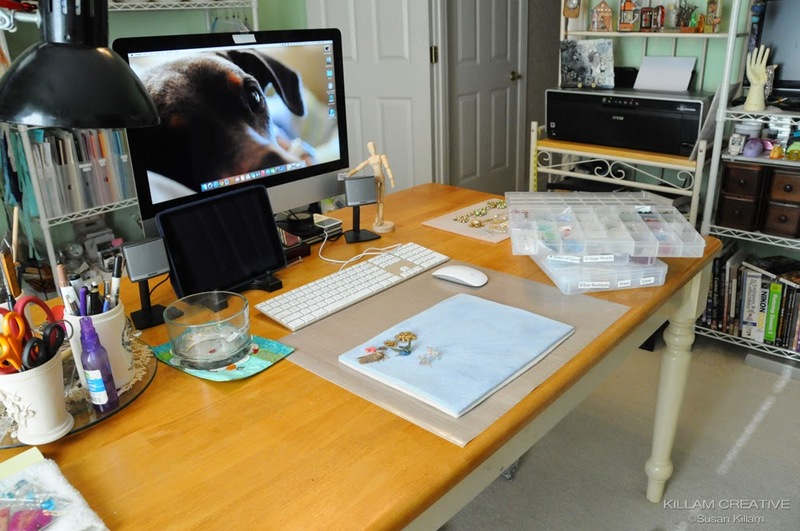 She is an experienced maker and generous with her time and knowledge, both with her Facebook Creative Group and her YouTube channel. This month through March she is is hosting a challenge/master class to build a line of jewelry, and offering her expertise to those of us signed up to learn the skills (and discipline?) of making a line of jewelry. There are nearly 60 of us! Of course we have to feature items from her shop in our designs, but that won't be a challenge for any of us as she stocks a huge amount of high quality components. 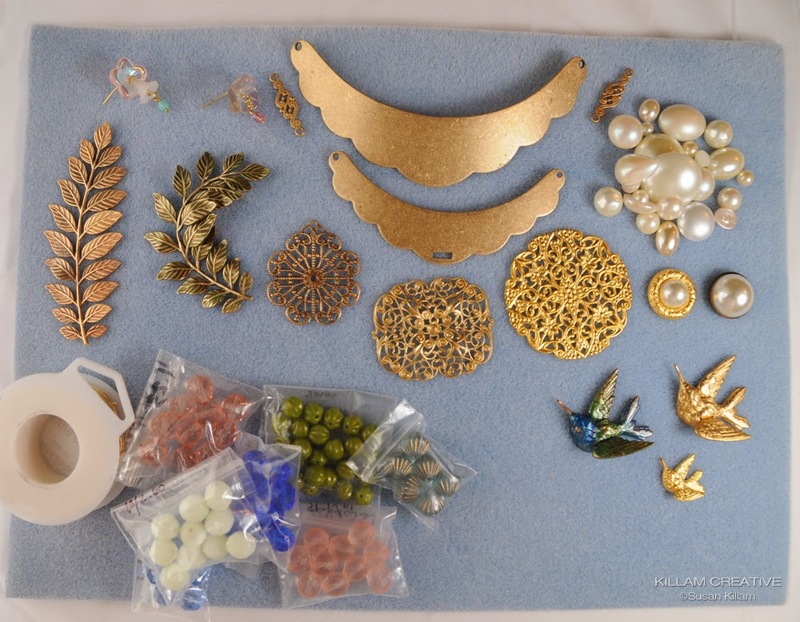 This challenge will also help me develop the skills to make one-of-a-kind vintage assemblage jewelry - combining gorgeous old rhinestone pieces with new components to make truly unique necklaces, bracelets, earrings, brooches and stick pins. For this challenge we will all participate in 3 blog hops, the first on in 9 days. I'll be able to share a little of my design ideas and progress photos. Wait, did I just write "9 days"?!?! Yikes. I've got to get to work fast! I hope you will join me on this journey to learn new skills. *wink* I'm practicing coloring raw brass with various mediums now. It's going... umm... err... Well, I can tell you it's going. I'll still share paper projects as I make them --or at least start them!-- including a Hallowe'en In Wonderland mini album I have on the shelf. Thanks for stopping by today. I hope your day is filled with creativity in any form.